EVERYTHING YOU EVER WANTED TO KNOW ABOUT BRASS! 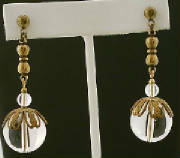 Brass seems to be the hot item now for creating old and new jewelry designs. The Victorians used it for less- expensive- than –gold jewelry and it has been used in the 20th century for creating “costume jewelry”. One interesting fact about brass is that it’s allergy-free for those who are allergic to other metals such as nickel. However, when any metal is plated, bear in mind that in most cases, an under-coating of nickel is plated on first so that the plated finish will adhere. That is the “silvery-looking” metal that shows through eventually when the top plating wears off. Raw brass ages so beautifully and comes in many tones, depending on the alloy and depending on the number of times the die machine is used for a particular run on stampings. When heated, brass will sometimes darken or turn a reddish color. Bear this in mind when soldering.Newer or older brass can be aged by “fuming” (See instructions on our store home-page or on our website!). 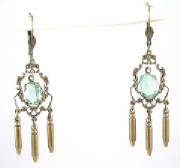 When buying old pieces, check for verdigris, the greenish color found on some metals. This is body-rot or oxidation, and will eventually ruin the piece by weakening the structure. Feel the piece to see if the surface is smooth or if it feels rough and crusty. Some people try to age brass by using a salt solution. This will leave a rough finish and salt is very corrosive. Sometimes, a light sanding with very fine sandpaper will correct the smoothness. It will not, however, correct the damage done to the metal. Eventually, it will become very brittle and will break. There is no fixing this problem. 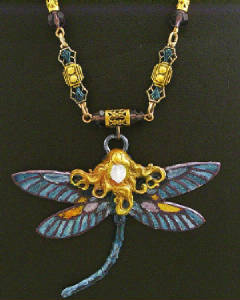 Brass can also be plated, painted, enameled, or stained with glass-stain. It’s a very versatile metal! No wonder it is so popular! If you are unsure as to whether or not an item is brass, subject the piece to a strong magnet. Brass can not be picked up with a magnet. A good magnet and a jeweler’s loupe are essential when shopping at estate sales, garage sales, or even old jewelry warehouses for brass treasures!